Buy others’ unused, unwanted Groupons with a new iPhone app. Call it the “day after” deal. A new smartphone app from DealsGoRound helps you take advantage of “Groupon remorse”–social-buying coupons for resale by people who know they won’t ever redeem them. Kris Petersen, DealsGoRound’s founder and CEO, first got the idea for the the service (whose main incarnation is this website) a few years ago. A Chicago native and early adopter of Groupon, he had purchased a four-person Segway tour of the city for $160, and was certain he’d use it that summer. But the summer came and went, Petersen didn’t use the Groupon–and DealsGoRound was born soon thereafter. “It wasn’t an impulse purchase. I really wanted to go on that Segway tour, and still do to this day,” he tells Fast Company. But the scheduling and weather just didn’t work out, and he could have benefited from the opportunity to sell off his coupon once he realized he wasn’t going to use it. He launched his website while sitting in the stands of a basketball stadium where his wife was coaching. Initially it formed as a Craigslist-style free market; as it took off, Petersen decided to relaunch the site with integrated PayPal functionality, taking a portion of each sale. He left the venture capital firm Lightbank (an early Groupon investor) about a month ago to handle DealsGoRound full-time. While the site handles both buyers and sellers of already-purchased social-buying coupons, the app, which launched on iPhone on March 7 and will come to Android in the next week or two, is intended to help buyers. Say you’re in the East Village in Manhattan and are in the mood for saving some money. Open up the app, see what deals are for sale in the area, and scoop one up. Unlike a primary Groupon purchase, you don’t have to wait for the deal to “tip”–since it already did, for the initial buyer. In addition to DealsGoRound, the Globe singled out CoupRecoup and Lifesta, which earned $1 million in a recent round of private funding, as other secondary sites. Each site has a different pricing scheme: DealsGoRound, a flat 10% fee on a sale; Lifesta, $0.99 plus 8% per sale; CoupRecoup, free (for now). The whole secondary market amounts something on the order of $1 billion, according to one estimate. Three studies or estimates have figured that only around 80% of Groupons and other social-buying coupons are redeemed; but the number is inexact, since sites like Groupon and LivingSocial aren’t forthcoming with that data themselves. How do the big social buying sites feel about sites like DealsGoRound? The smaller ones like it, the bigger ones offer no comment, Petersen tells Fast Company. (He says, being from Chicago and a part of that community, he knows Groupon CEO Andrew Mason.) Currently social buying sites benefit from the secondary market, which acts as a sort of mental insurance policy for anyone clicking “buy” on a Groupon or LivingSocial offer. Groupons, then, and the secondary market, are not just about economics. At heart, Groupon is about the quintessentially American idea that we can change ourselves, that we can be who we want to be–and that this coupon, dammit, will force you to be a dieter; a dancer; a Pilates expert; a tanner, svelter, and generally-less-hairy person. DealsGoRound, fundamentally, is about disillusionment: the revelation that that dream was just a dream. 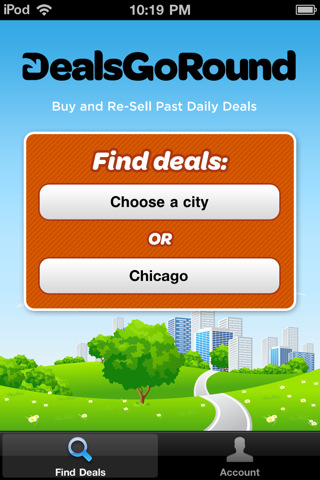 DealsGoRound gives the lie to Groupon’s promise, and with its new app, you can profit off others’ disillusionment wherever you go (or at least, in the seven major U.S. cities currently served). Just be sure that once you buy someone’s deferred dream, you actually make good on it yourself.